“Latin name” redirects here. For personal names in the Roman Empire, see Roman naming conventions. Binomial nomenclature (“two-term naming system”), also called binominal nomenclature (“two-name naming system”) or binary nomenclature, is a formal system of naming species of living things by giving each a name composed of two parts, both of which use Latin grammatical forms, although they can be based on words from other languages. Such a name is called a binomial name (which may be shortened to just “binomial”), a binomen, binominal name or a scientific name; more informally it is also called a Latin name. The first part of the name – the generic name – identifies the genus to which the species belongs, while the second part – the specific name or specific epithet – identifies the species within the genus. For example, humans belong to the genus Homo and within this genus to the species Homo sapiens. Tyrannosaurus rex is probably the most widely known binomial. The formal introduction of this system of naming species is credited to Carl Linnaeus, effectively beginning with his work Species Plantarum in 1753. But Gaspard Bauhin, in as early as 1623, had introduced in his book Pinax theatri botanici (English, Illustrated exposition of plants) many names of genera that were later adopted by Linnaeus. “Patella vulgata Linnaeus, 1758″. The name “Linnaeus” tells the reader who it was that first published a description and name for this species of limpet; 1758 is the date of the publication in which the original description can be found (in this case the 10th edition of the book Systema Naturae). “Passer domesticus (Linnaeus, 1758)”. The original name given by Linnaeus was Fringilla domestica; the parentheses indicate that the species is now considered to belong in a different genus. The ICZN does not require that the name of the person who changed the genus be given, nor the date on which the change was made, although nomenclatorial catalogs usually include such information. “Amaranthus retroflexus L.” – “L.” is the standard abbreviation used in botany for “Linnaeus”. “Hyacinthoides italica (L.) Rothm. – Linnaeus first named this bluebell species Scilla italica; Rothmaler transferred it to the genus Hyacinthoides; the ICNafp does not require that the dates of either publication be specified. The name is composed of two word-forming elements: “bi”, a Latin prefix for two, and “-nomial”, relating to a term or terms. The word “binomium” was used in Medieval Latin to mean a two-term expression in mathematics. Prior to the adoption of the modern binomial system of naming species, a scientific name consisted of a generic name combined with a specific name that was from one to several words long. Together they formed a system of polynomial nomenclature. These names had two separate functions. First, to designate or label the species, and second, to be a diagnosis or description; however these two goals were eventually found to be incompatible. In a simple genus, containing only two species, it was easy to tell them apart with a one-word genus and a one-word specific name; but as more species were discovered the names necessarily became longer and unwieldy, for instance Plantago foliis ovato-lanceolatus pubescentibus, spica cylindrica, scapo tereti (“Plantain with pubescent ovate-lanceolate leaves, a cylindric spike and a terete scape”), which we know today as Plantago media. Such “polynomial names” may sometimes look like binomials, but are significantly different. For example, Gerard’s herbal (as amended by Johnson) describes various kinds of spiderwort: “The first is called Phalangium ramosum, Branched Spiderwort; the second, Phalangium non ramosum, Unbranched Spiderwort. The other … is aptly termed Phalangium Ephemerum Virginianum, Soon-Fading Spiderwort of Virginia”. The Latin phrases are short descriptions, rather than identifying labels. The Bauhins, in particular Caspar Bauhin (1560–1624), took some important steps towards the binomial system, by pruning the Latin descriptions, in many cases to two words. 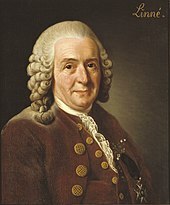 The adoption by biologists of a system of strictly binomial nomenclature is due to Swedish botanist and physician Carl von Linné, more commonly known by his Latinized name Carl Linnaeus (1707–1778). It was in his 1753 Species Plantarum that he first began consistently using a one-word “trivial name” together with a generic name in a system of binomial nomenclature. This trivial name is what is now known as a specific epithet (ICNafp) or specific name (ICZN). The Bauhins’ genus names were retained in many of these, but the descriptive part was reduced to a single word. Linnaeus’s trivial names introduced an important new idea, namely that the function of a name could simply be to give a species a unique label. This meant that the name no longer need be descriptive; for example both parts could be derived from the names of people. Thus Gerard’s Phalangium ephemerum virginianum became Tradescantia virginiana, where the genus name honoured John Tradescant the Younger,[note 1] an English botanist and gardener. A bird in the parrot family was named Psittacus alexandri, meaning “Alexander’s parrot”, after Alexander the Great whose armies introduced eastern parakeets to Greece. Linnaeus’s trivial names were much easier to remember and use than the parallel polynomial names and eventually replaced them. Uniqueness. Provided that taxonomists agree as to the limits of a species, it can have only one name that is correct under the appropriate nomenclature code, generally the earliest published if two or more names are accidentally assigned to a species. However, establishing that two names actually refer to the same species and then determining which has priority can be difficult, particularly if the species was named by biologists from different countries. Therefore, a species may have more than one regularly used name; all but one of these names are “synonyms“. Taxonomy includes both nomenclature and classification. Its first stages (sometimes called “alpha taxonomy“) are concerned with finding, describing and naming species of living or fossil organisms. Binomial nomenclature is thus an important part of taxonomy as it is the system by which species are named. Taxonomists are also concerned with classification, including its principles, procedures and rules. Latin, either classical or medieval. Thus, both parts of the binomial name Homo sapiens are Latin words, meaning “wise” (sapiens) “human/man” (Homo). Other languages. The second part of the name Erythroxylum coca is derived from kuka, the name of the plant in Aymara and Quechua. Since many dinosaur fossils were found in Mongolia, their names often use Mongolian words, e.g. Tarchia from tarkhi, meaning “brain”, or Saichania meaning “beautiful one”. The second part of a binomial may be an adjective. The adjective must agree with the genus name in gender. Latin has three genders, masculine, feminine and neuter, shown by varying endings to nouns and adjectives. The house sparrow has the binomial name Passer domesticus. Here domesticus (“domestic”) simply means “associated with the house”. The sacred bamboo is Nandina domestica rather than Nandina domesticus, since Nandina is feminine whereas Passer is masculine. The tropical fruit langsat is a product of the plant Lansium parasiticum, since Lansium is neuter. Some common endings for Latin adjectives in the three genders (masculine, feminine, neuter) are -us, -a, -um (as in the previous example of domesticus); -is, -is, -e (e.g. tristis, meaning “sad”); and -or, -or, -us (e.g. minor, meaning “smaller”). For further information, see Latin declension: Adjectives. The second part of a binomial may be a noun in the genitive (possessive) case. The genitive case is constructed in a number of ways in Latin, depending on the declension of the noun. Common endings for masculine and neuter nouns are -ii or -i in the singular and -orum in the plural, and for feminine nouns -ae in the singular and -arum in the plural. The noun may be part of a person’s name, often the surname, as in the Tibetan antelope (Pantholops hodgsonii), the shrub Magnolia hodgsonii, or the olive-backed pipit (Anthus hodgsoni). The meaning is “of the person named”, so that Magnolia hodgsonii means “Hodgson’s magnolia”. The -ii or -i endings show that in each case Hodgson was a man (not the same one); had Hodgson been a woman, hodgsonae would have been used. The person commemorated in the binomial name is not usually (if ever) the person who created the name; for example Anthus hodgsoni was named by Charles Wallace Richmond, in honour of Hodgson. Rather than a person, the noun may be related to a place, as with Latimeria chalumnae, meaning “of the Chalumna River“. Another use of genitive nouns is in, for example, the name of the bacterium Escherichia coli, where coli means “of the colon“. This formation is common in parasites, as in Xenos vesparum, where vesparum means “of the wasps”, since Xenos vesparum is a parasite of wasps. “Binomial nomenclature” is the correct term for botany, although it is also used by zoologists. Since 1953, “binominal nomenclature” is the technically correct term in zoology. A binominal name is also called a binomen (plural binomina). Both codes consider the first part of the two-part name for a species to be the “generic name”. In the zoological code (ICZN), the second part of the name is a “specific name”. In the botanical code (ICNafp), it is a “specific epithet”. Together, these two parts are referred to as a “species name” or “binomen” in the zoological code; or “species name”, “binomial”, or “binary combination” in the botanical code. “Species name” is the only term common to the two codes. The starting points, the time from which these codes are in effect (retroactively), vary from group to group. In botany the starting point will often be in 1753 (the year Carl Linnaeus first published Species Plantarum). In zoology the starting point is 1758 (1 January 1758 is considered the date of the publication of Linnaeus’s Systema Naturae, 10th Edition, and also Clerck’s Aranei Svecici). Bacteriology started anew, with a starting point on 1 January 1980. As noted above, there are some differences between the codes in the way in which binomials can be formed; for example the ICZN allows both parts to be the same, while the ICNafp does not. Another difference is in the way in which personal names are used in forming specific names or epithets. The ICNafp sets out precise rules by which a personal name is to be converted to a specific epithet. In particular, names ending in a consonant (but not “er”) are treated as first being converted into Latin by adding “-ius” (for a man) or “-ia” (for a woman), and then being made genitive (i.e. meaning “of that person or persons”). This produces specific epithets like lecardii for Lecard (male), wilsoniae for Wilson (female), and brauniarum for the Braun sisters. By contrast the ICZN does not require the intermediate creation of a Latin form of a personal name, allowing the genitive ending to added directly to the personal name. This explains the difference between the names of the plant Magnolia hodgsonii and the bird Anthus hodgsoni. Furthermore, the ICNafp requires names not published in the form required by the code to be corrected to conform to it, whereas the ICZN is more protective of the form used by the original author. By tradition, the binomial names of species are usually typeset in italics; for example, Homo sapiens. Generally, the binomial should be printed in a font style different from that used in the normal text; for example, “Several more Homo sapiens fossils were discovered.” When handwritten, a binomial name should be underlined; for example, Homo sapiens. The binomial name should generally be written in full. The exception to this is when several species from the same genus are being listed or discussed in the same paper or report, or the same species is mentioned repeatedly; in which case the genus is written in full when it is first used, but may then be abbreviated to an initial (and a period/full stop). For example, a list of members of the genus Canis might be written as “Canis lupus, C. aureus, C. simensis“. In rare cases, this abbreviated form has spread to more general use; for example, the bacterium Escherichia coli is often referred to as just E. coli, and Tyrannosaurus rex is perhaps even better known simply as T. rex, these two both often appearing in this form in popular writing even where the full genus name has not already been given. The abbreviation “cf.” (i.e. confer in Latin) is used to compare individuals/taxa with known/described species. Conventions for use of the “cf.” qualifier vary. In paleontology, it is typically used when the identification is not confirmed. For example, “Corvus cf. nasicus” was used to indicate “a fossil bird similar to the Cuban crow but not certainly identified as this species”. In molecular systematics papers, “cf.” may be used to indicate one or more undescribed species assumed related to a described species. For example, in a paper describing the phylogeny of small benthic freshwater fish called darters, five undescribed putative species (Ozark, Sheltowee, Wildcat, Ihiyo, and Mamequit darters), notable for brightly colored nuptial males with distinctive color patterns, were referred to as “Etheostoma cf. spectabile” because they had been viewed as related to, but distinct from, Etheostoma spectabile (orangethroat darter). This view was supported in varying degrees by DNA analysis. The somewhat informal use of taxa names with qualifying abbreviations is referred to as open nomenclature and it is not subject to strict usage codes. In some contexts the dagger symbol (“†”) may be used before or after the binomial name to indicate that the species is extinct. In scholarly texts, at least the first or main use of the binomial name is usually followed by the “authority” – a way of designating the scientist(s) who first published the name. The authority is written in slightly different ways in zoology and botany. For names governed by the ICZN the surname is usually written in full together with the date (normally only the year) of publication. The ICZN recommends that the “original author and date of a name should be cited at least once in each work dealing with the taxon denoted by that name.” For names governed by the ICNafp the name is generally reduced to a standard abbreviation and the date omitted. The International Plant Names Index maintains an approved list of botanical author abbreviations. Historically, abbreviations were used in zoology too. (Plant) Amaranthus retroflexus L. – “L.” is the standard abbreviation for “Linnaeus”; the absence of parentheses shows that this is his original name. Ranks below species receive three-part names, conventionally written in italics like the names of species. There are significant differences between the ICZN and the ICNafp. In zoology, the only rank below species is subspecies and the name is written simply as three parts (a trinomen). Thus one of the subspecies of the olive-backed pipit is Anthus hodgsoni berezowskii. In botany, there are many ranks below species and although the name itself is written in three parts, a “connecting term” (not part of the name) is needed to show the rank. Thus the American black elder is Sambucus nigra subsp. canadensis; the white-flowered form of the ivy-leaved cyclamen is Cyclamen hederifolium f. albiflorum. ^ The ending “-on” may derive from the neuter Greek ending –ον, as in Rhodoxylon floridum, or the masculine Greek ending –ων, as in Rhodochiton atrosanguineus. ^ Bauhin, Gaspard. “Pinax theatri botanici”. Kyoto University Library. Retrieved 19 June 2016. ^ See entry “binôme” in le Trésor de la langue française informatisé. ^ Darpan, Pratiyogita (2007), “General Principles of Taxonomy”, Competition Science Vision, 10 (114): 764–767, retrieved 20 June 2011. ^ Cantino, P. D.; Bryant, H. D.; de Queiroz, K.; Donoghue, M. J.; Eriksson, T.; Hillis, D. M.; Lee, M. S. Y. (1999). “Species names in phylogenetic nomenclature” (PDF). Systematic Biology. 48 (4): 790–807. doi:10.1080/106351599260012. PMID 12066299. ^ Shipunov, Alexey (16 January 2013). “The problem of hemihomonyms and the on-line hemihomonyms database (HHDB)”. Bionomina. 4 (1). doi:10.11646/bionomina.4.1.3. ^ Harper, Douglas. “rhododendron”. Online Etymology Dictionary. ^ “How to Write Scientific Names of Organisms” (PDF), Competition Science Vision, retrieved 20 June 2011. ^ Bengtson, P. (1988). “Open nomenclature” (PDF). Palaeontology. 31 (1): 223–227. Archived from the original (PDF) on 6 October 2014. Retrieved 22 August 2014. ^ Orihuela, J. (2013). “Fossil Cuban crow Corvus cf. nasicus from a late Quaternary cave deposit in northern Matanzas, Cuba”. Journal of Caribbean Ornithology. 26: 12–16. Retrieved 22 August 2014. ^ Near, T. J.; Bossu, C. M.; Bradburd, G. S.; Carlson, R. L.; Harrington, R. C.; Hollingsworth, P. R.; Keck, B. P.; Etnier, D. A. (2011). “Phylogeny and temporal diversification of darters (Percidae: Etheostomatinae)”. Systematic Biology. 60 (5): 565–595. doi:10.1093/sysbio/syr052. PMID 21775340. Retrieved 22 August 2014.